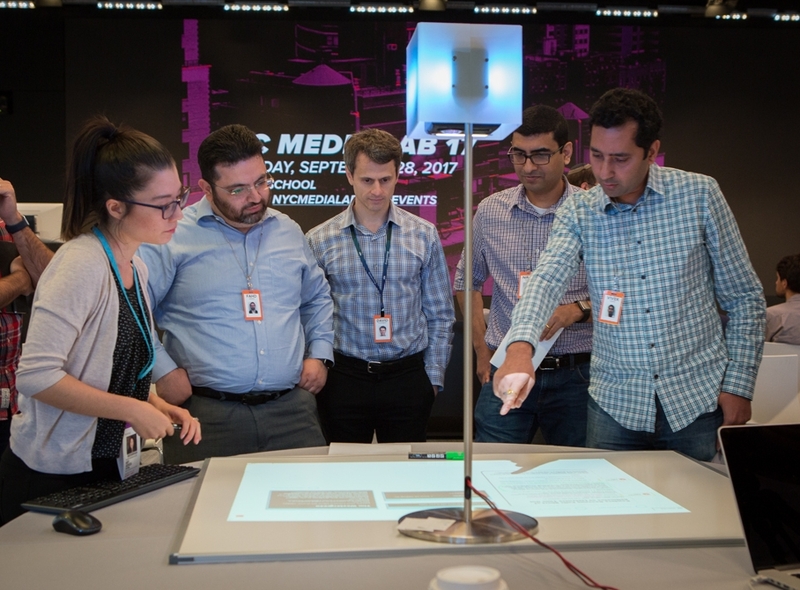 NYC Media Lab, in partnership with Bloomberg and augmented reality startup Lampix, produced a rapid prototyping fellowship to explore how applications of AR technology can improve the business office setting. Fellows were asked to consider the following areas of exploration: team collaboration, reduction of work of friction, document processing, data analysis and display of digital documents. The 5 resulting AR projects pushed the boundaries of physical and digital interfaces with the data-driven user in mind. Prototyping Use Case: What is future interaction between users and data in AR? Focusing on data scientists and business analysts as potential users, this prototype explores possibilities of Lampix for visualizing and analyzing time-series data in an enterprise setting. Building upon data integration, interface design and data visualization, it provides interactive data visualizations on table surfaces and allows the users to control Lampix with a physical object as a controller. Prototyping Use Case: To create a tactile experience for connecting and joining distinct entities to recognize relationships between them. The idea is to replace the whiteboard or even smartboard for users to instantly create or make changes on business and systems solution architecture diagrams to trigger innovation through in-person or remote collaboration. Prototyping Use Case: Exploration into data analysis and team collaboration in AR using pivot tables. Pivot tables provide an entry into data analytics from raw data. They allow users to consume data in a more digestible way, look for patterns and form conclusions without complex coding or development. Pivot tables in AR take advantage of our natural gestures to make this process more intuitive and expand this process into a collaborative space to further insights and discover hidden trends within the data. Prototyping Use Case: Analysts spend a lot of their time forming hypotheses as to where their firms should invest. When looking for qualitative trends, they spend time reading through articles and reports, often exporting and printing PDFs so they can mark them up. After making their notes, they have to go through the cumbersome process of scanning and organizing. What if this process was all digital, had fewer steps, and yet still provided the benefits of looking at information outside the screen? Data Visualization + Virtual Reality: What's Next for the Sports Fan Experience?